High Tech Sound & Lighting covers new 1000-seat auditorium in Tacoma, Washington with VIO L210 line arrays and DVA S2585N cardioid subwoofers. Life Christian Church in Tacoma, Washington enjoys a beautiful new church building with dBTechnologies VIO line arrays. As part of the Slavic National District of the Assemblies of God, Life Christian holds many of its services in the Ukrainian language with simultaneous translation into English. The church has an active music service with a 60-person choir and a band with drums, electric and acoustic guitars, bass, keyboard and piano. 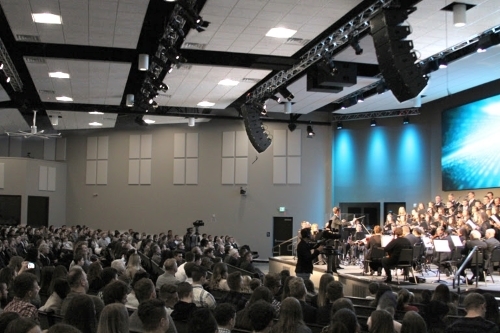 The church’s new audio system was installed by integrator High Tech Sound & Lighting of Kent, WA who also installed Life Christian’s new lighting system. High Tech’s Vasyl Mulyarchuk consulted with the architect and building committee during planning and says the church wanted a system that would cover its new 1000-seat auditorium evenly with good voice clarity and high music quality without the need to be overly loud to achieve these goals. High Tech, which is a production company as well as an integrator, held a loudspeaker showcase for area churches in mid-2017. After that showcase, Mulyarchuk says the VIO system was an easy choice for Life Christian. Life Christian’s new system consists of left and right hangs of six dBTechnologies VIO L210 self-powered line arrays, a single DVX D12HP as a center fill and a pair of center-hung dBTechnologies DVA S2585N self-powered cardioid subwoofers for low-frequency support. For the band and vocalists, High Tech installed six dBTechnologies DVX D12HP monitors, hidden in the stage. Five DVX D10HP monitors, suspended behind the main loudspeaker system, serve as choir monitors and another pair of DVX D10HP’s are installed as side-fill monitors. High Tech set up and commissioned the system using dBTechnologies RDNet software and VIO’s built-in amplification and DSP.